20/12/2014 Weddington Castle's website turns ten on 3rd January 2015! Read a message from the webmaster and enter a celebration competition at this link. New image of William Worrell, chauffeur to the Phillips' family of Ansley Hall added. 11/12/2014 Two photos of a 1950s wedding reception at Astley Castle added. 2012 account and photographs of MIRA-owned section of Nuneaton-Ashby rail line added to Lindley Hall section. Image of control tower at former Lindley Airfield site added to Lindley Hall section. Two new images of Lindley Lodge from 1890s/1900s added. 09/12/2014 Image of Warwickshire Imperial Yeomanry passing through Abbey Street added to Nuneaton Town gallery. 07/12/2014 Five photos of Nuneaton Priory ruins added. 06/12/2014 Page on Grendon Hall added to Local Halls section. 05/12/2014 Seven images from the 1982 play 'Pranks', written by Gef White and based on the murder of Polly Button by John Danks, added. 03/12/2014 Four images of burnt interior of Caldecote Hall from 2002 added, along with 2 slideshows - one of Cadecote Hall & Grounds in 2014 and one of St Theobald & St Chad Church, Caldecote in 2014. 02/12/2014 Image of William Worrell, chauffeur to the Phillips' family of Ansley Hall added. 30/11/2014 New image of mother and baby outside Ansley Hall added. Updated historical text on Camp Hill Hall added, along with new image of historical themed windows added to the estate's community centre. 6 new items added to Castle Shop - sports water bottle, and clip on mobile phone covers for iPhone 4, 5, 5c, Samsung Galaxy 3 and Samsung Galaxy 4. 29/11/2014 Details on John Barber, inventor of the gas turbine who lived at Weddington Hall in the 1780s added to History section. 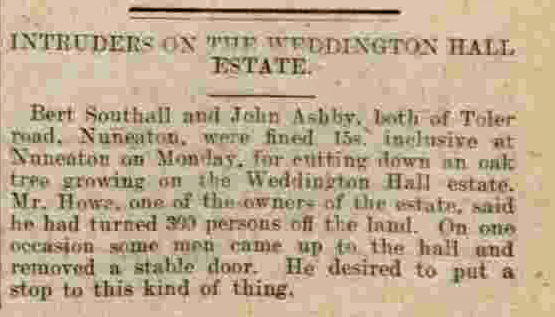 Newspaper report from 1926 added, showing that pilfering on the derelict Weddington estate was rife before it was demolished. 28/11/2014 A record of a William Crowther, a Gloucestershire farmer in his 40s, who purchased the Hall around 1859 after coming into some inheritance. There is a rather detailed account of his split with his younger wife in 1863 due to alleged adultery that can be read here (in column 1). It appears that Henry Cunliffe Shawe had been somewhat ill prior to his death. The Tamworth Herald reporting a fall in the month prior to this has been added. His obituary from the Herald on August 5th 1911 can be read here. His wife, Georgina's, obituary from 1927 can be read here. ﻿﻿Fascinating account of presentations made to nursing staff of the Weddington Castle Red Cross Hospital after the end of WW1. (Tamworth Herald - Saturday 14 June 1919)﻿﻿ added (in the fifth column along). 23/11/2014 10 images of Ansley Hall in the 1980s added. Landmark Trust video of Astley Castle restoration added. Springfield House added to 'Local Halls' section. 16/11/2014 New original photo dated 1906 added to Weston Hall page. Image added of 1906 opening of Atherstone Hunt at Caldecote Hall. 15/11/2014 Video tour added to Griff House page. Also, page on Ansty Hall added to Local Halls section. 01/07/2014 Fox and Crane developers have finally struck a deal with council to allow it to be converted into 6 apartments by "Experts from a conservation and heritage development firm." You can read more here. 24/03/2014 Photo of King Edward VI College 1905 added to 'Picture Gallery' plus 2 images of building work starting on Weddington Church fields added here. 01/01/2014 9 more images added of Weddington Road bridge being dismantled in 2011. Images of Caledcote Hall Summer House, Mews, Stable block and bungalow from 2013 added to 'Local Halls' section.